Whether it is out of necessity or for fun, travel should be easy and pleasurable. Travel usually invokes positive thoughts in people. However, actually getting from place to place, by plane, for instance, is often seen as a stressful, unfortunate necessity. Unpleasant moments come up at all stages of the trip. Sometimes you’re missing your gate number. Sometimes it’s hard to find your travel documents. Sometimes it’s stressful when you don’t know what’s going to happen next on your flight. When leaving for a trip, every moment is important. The process should flow without a hitch and without any annoying stages, above all, it should allow passengers to concentrate on what’s important to them. The Finnair mobile application – available for iOS, Android and Apple Watch – is passengers’ best friend from the very beginning of the journey. Designed as a part of Finnair’s holistic digital concept, it aims at inspiring passengers, as well as streamlining the early steps of each journey. Before the journey starts, passengers can easily upgrade to business class or buy an extra bag, should their traveling plans change after purchasing the flight. Once at the airport, the application enables passengers to avoid queues by checking in on their mobile phones, store travel documents in one easy-to-access place and minimize the hassle of connecting flights by helping passengers to be in the right place at the right time. The application also views schedules, transfer airport information and terminal maps, so the passenger has the information on the most convenient transfer or exit in their pocket when it is most needed – just as the plane touches down. 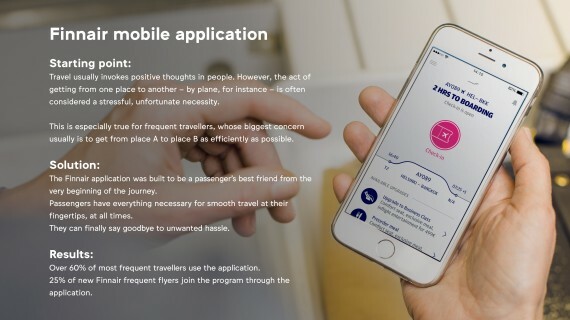 Nowadays, two thirds of Finnair’s most valuable customers are now using the application. 25% of new Finnair frequent flyers join the program through the application.